BirdingRVers: How are you and where are you? Since it has been almost a month since our last blog entry we have gotten a few inquiries asking if we are okay and a few asking where we are. First we are both fine and secondly we are in our former hometown of San Jose, California. We have been very busy getting our annual doctor and dentist checkups taken care of and visiting family and friends. We have had something going on every day since we have been back. To bring you up to date on our travels, both Kathy and I have sisters that live in the greater Los Angeles area between I-5 and California Highway 14. There aren’t many choices of RV Parks near there, but the closest one to them was only 50 miles off of our route back toward San Jose. We decided to make a small detour to visit with them for a few days. I wrote back on January 4th that while we were staying at this RV Park “the wind started to come up and the wind got stronger and colder all night.” This time the wind blew day and night from the moment we arrived until we left. However it wasn’t cold, this was the Santa Anna wind that comes off the desert and causes the fierce wildfires that are all too common in Southern California. We were there during the recent Sylmar, Newhall Pass and Freeway Complex fires. We were not close enough to be in any danger, but we could see the smoke from the fires during the day and the flames at night. After a nice visit with our sisters we decided it was time for an ocean “fix”. It had been three months since we were last at the ocean back in Homer, Alaska. 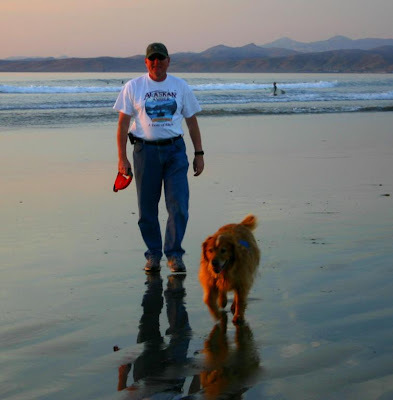 We decided to go to Morro Bay, California, it is on California’s central coast north of San Luis Obispo. One of the best kept secrets of California are the coastal areas in the fall. There is usually less fog than in the summer months, the days are surprisingly warm and the crowds are gone. We picked the Morro Dunes RV Park for our stay. The park was less than half full and is just across the road from the beach and Morro Rock. 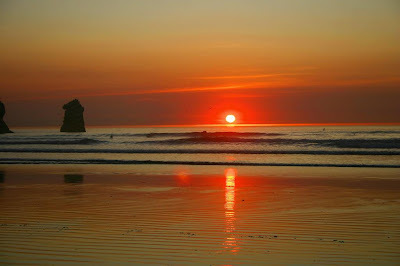 Morro Bay is a typical California beach town with the usual string of motels, galleries, restaurants and curio shops. We did the obligatory stroll on the waterfront. Visited the galleries, curio shops and ate at the Great American Fish Company. 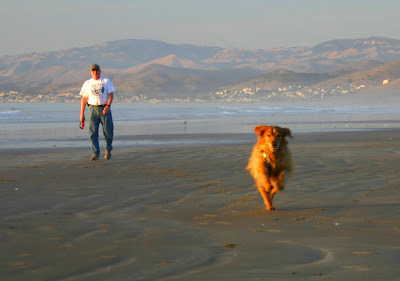 Raider loves to run on sandy beaches and with the weather so nice he got two very long beach walks each day. He would run too exhaustion and then need to sleep until time for the next beach walk. After a great week in Morro Bay we had an uneventful trip to San Jose. We are staying at the Coyote Valley RV Resort where our adventure started 11 months ago. In those 11 months we have travelled 25,000 miles, visited 17 states, 5 Canadian provinces, gone to 14 national parks and spent $7,000 on diesel fuel. 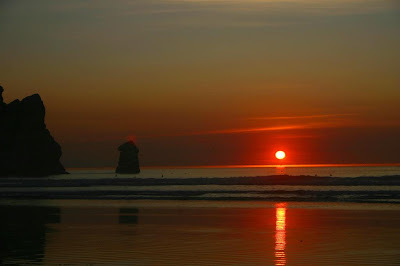 We will be here until just after Christmas and then back on the road for a new adventure in 2009. Thanks for the updated post...great pictures!!! Isn't it about time for an update???? ?